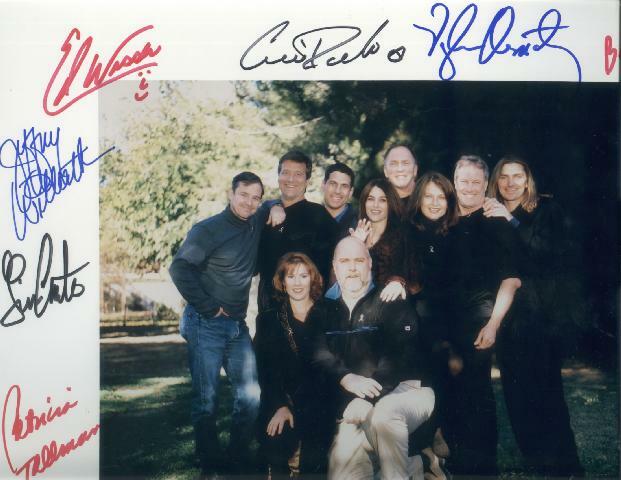 In 2002, 10 actors from Babylon 5, Crusade, and Star Trek came together for a charity sale that would benefit the victims from the World Trade Center attacks, as well as the Penny Lane charity. They created a picture of the 10 together. Actually, the picture is in the center of the photograph, surrounded by a white border, which is where they have signed autographs. It is also hand-numbered, limited to 1000. I have number 11 (the stars have 1-10 themselves), which is the lowest number available! The stars are, from left to right (back row) - Tim Choate (Zathras/Pollax>, Jeff Willerth (Kosh/Ulkesh), Ed Wasser (Mr. Morden), Carrie Dobro (Dureena), Vaughn Armstrong (nightwatch), Beata Pozniak (President Luchenko), David Allen Brooks (Max Eilerson), and Robin Downes (Morann/Byron). Front Row: Patricia Tallman (Lyta Alexander), and Stephen Austin (Pak'Ma'Ra Ambassador). Because of the size of the picture (11x14), I've had to take 3 scans of it to get it all in. 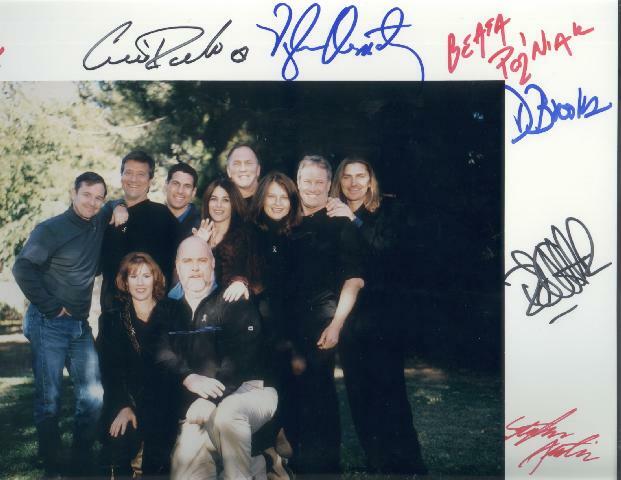 ^ Patricia, Tim, Jeffrey, Ed, Carrie, Vaughn, and part of Beata. ^ Robin and Stephen, plus the number - 11 of 1000 If you're interested in getting on of these for yourself, you can click here for details.